Protesters marched to Governor Jay Nixon’s downtown office building, demanding that he withdraw National Guard troops from Ferguson. 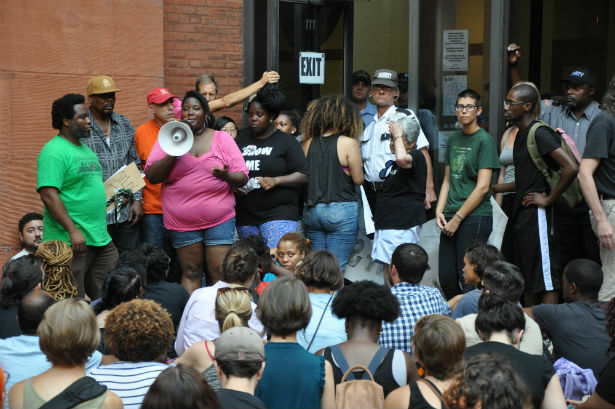 St. Louis—In the second week of protests over the shooting death of Michael Brown by a police officer, St. Louis Metropolitan police on Monday arrested nine protesters for blocking the entrance of a state office building. 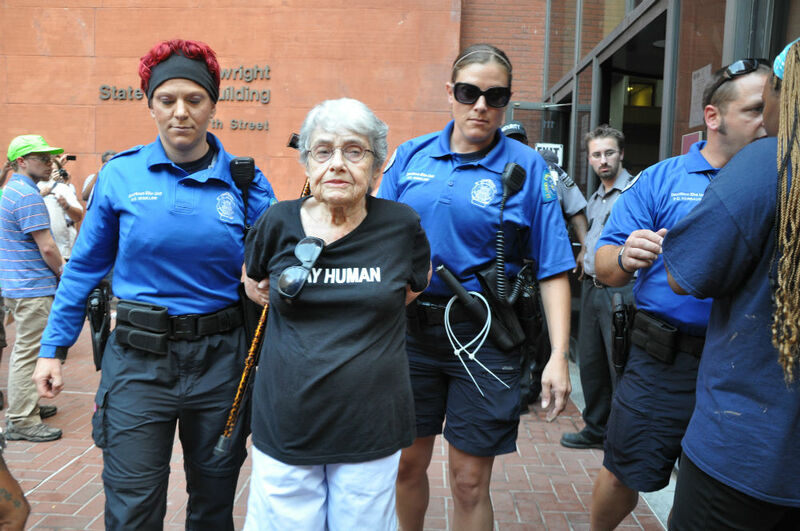 Among those arrested was Hedy Epstein, a 90-year-old Holocaust survivor who lives in St. Louis. Roughly 125 protesters marched to the entrance of the historic Wainwright Building, which houses Missouri Governor Jay Nixon’s downtown office. They demanded Nixon withdraw National Guard troops from Ferguson municipality, where peaceful protests throughout the week were disrupted by late night riots. The protesters also called for a special prosecutor to lead the investigation of Brown’s death, as well as an expansion of the Department of Justice’s existing investigation to look into patterns of civil rights violations across North St. Louis County. Nine demonstrators linked arms in front of security guards at the building’s entrance, as police officers watched from inside. At around 4:20 pm, a police officer informed the nine that they each faced arrest for blocking the doorway. Shortly after, police escorted each demonstrator away in plastic handcuffs. St. Louis police charged the nine arrestees with failure to disperse. All but one of were released, according to Jeff Ordower, an organizer with Missourians Organizing for Reform and Empowerment. Police also arrested Ebony Williams, a 22-year-old from St. Louis. Williams, who is pregnant, earlier told the crowd that she worries about raising her son around police officers that could target him because of his race. CORRECTION (8/19/2014 3:06 am): An earlier version of this post stated that eight protesters were arrested in downtown St. Louis on Monday. In fact, nine were arrested.